Buy Jason Age Renewal Vitamin 25,000iu Moisturizing Creme in the UK from our online shop or directly from our independent Scottish store. This botanically-rich Vitamin E Cream naturally delivers deep, long-lasting moisturization and effectively helps minimize the visible signs of skin aging. This botanically-rich Vitamin E Cream naturally delivers deep, long-lasting moisturization and effectively helps minimize the visible signs of skin aging. Rejuvenating Vitamin E replenishes lost moisture. Natural Avocado Oil, high in essential fatty acids, helps restore elasticity and resilience. As official Jason stockist, we sell genuine Facial Moisturisers directly from our shop in Scotland and online throughout the UK. Where can you buy real Age Renewal Vitamin E 25,000iu safely online? If you are wondering where you can buy Jason Age Renewal Vitamin 25,000iu Moisturizing Creme safely online in the UK, then shop with us. We are an actual health foods shop; with real people selling real foods and products. Our award-winning independent shop is located in Stirling, Scotland since 1976. You can buy our Natural care products and other genuine Facial Moisturisers in store or safely place an order with us online or over the phone. 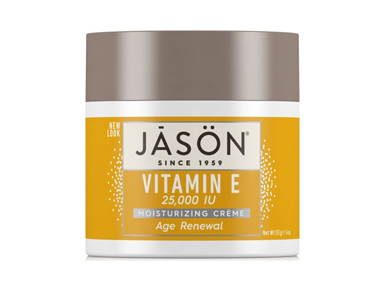 Age Renewal Vitamin E 25,000iu - Jason Age Renewal Vitamin 25,000iu Moisturizing Creme in Facial Moisturisers and Facial Care.